The buildings are always designed to resist the natural disasters like earthquake, fire, flood, cyclone, etc. but sometimes they cannot tolerate the excessive forces of disaster, and they fail to perform well during the service life. Building failure refers to the loss of structural homogeneity and integrity. The building components are stressed beyond its strength limit, and building ultimately loses their load carrying capacity. Here we discuss why the RCC framed structure or a building collapse due to the excessive forces due to the natural disaster like earthquake, cyclone, storm, flood, etc. The natural disaster keeps occurring in different parts of the world at various times and in various scales which creates the loss of lives and properties. 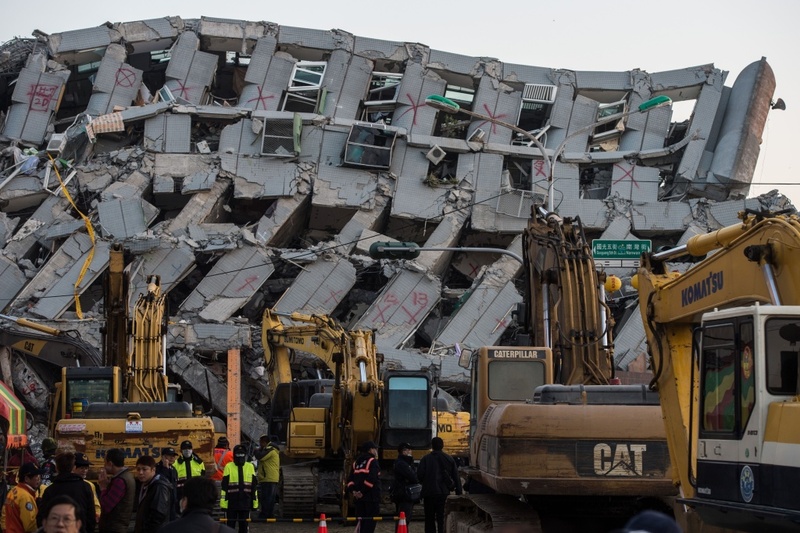 The buildings are normally designed to resist such natural forces, but sometimes when not adequately designed to withstand natural forces, the building may collapse. Hence the forces of natural disaster may become a major reason for building collapse. How the Earthquake Affects the Building? During the earthquake, the seismic waves cause the shaking of ground. If the intensity of the seismic wave is high, it may result in high shaking of the ground and buildings. Sometimes shaking of the ground also becomes the reason for the large landslide or soil liquefaction which may subject excessive force on the building. It affects the stability of building, and ultimately building may collapse partially or totally. Sometimes shaking of the building during earthquake also breaks the electrical or gas line which results in fire. If the intensity of fire is high, fire melts the steel and cause the failure of the steel/ wooden framed structure. In case of RCC building, the temperature of the moisture entrapped in the concrete turns into steam and generates pressure in concrete. The pressure causes an explosive spalling or cracking of concrete. Further, the fire melts the reinforcement bars of spalled or cracked concrete. Thus, the fire can affects the stability of the building and it becomes the reason for the collapse of the building. Whether, the fire is generated due to an earthquake or due to any other reasons, it may become the reason for the failure of buildings. Hence, every building should be designed in such a way that they can resist the natural force occurs during the earthquake and should be designed as per the seismic zones. Furthermore, whether, the building is the steel framed structure or RCC framed structure, they should be designed for the fire suppression systems (water sprinklers), which prevent a fire. How the Cyclone or Storm Affect the Building? The cyclone is a large scale wind which rotates around a centre where the pressure is low. The storm is the disaster which disturbs the atmosphere with strong winds. During the cyclone or storm, if the intensity of wind is very high, it exerts the high pressure on the windward side of the building. High wind pressure may affect the stability of building and if the building is not designed for the wind load, it causes the collapse of building either partially or totally. Hence building should also be designed in such a way that they can resist high wind pressure. How the Floods Affect the Building? Flood is the large-scale water due to the heavy rain. Heavy rain occurs for a short period of time and rivers or streams overflow their banks. During the flood, if the force of water is very high then it exerts high pressure on the lower part of the building. If the building is not designed for flood pressure then it may break the foundation or may cause the foundation movement in the building. Thus, the building may collapse due to the uneven stresses developed by the high water pressure of the flood. Hence building should also be designed in such a way that they can resist the high water pressure of the flood. In conclusion, the buildings should be designed to resist loads due to natural disasters so they will not disturb the stability of the structure that the best way is to honour all codal provision and design in accordance with all provision of codes of structural design. Also Read: Why You should Insure Your House? Frequently monitor the press release government agencies which forecast natural disasters and who avoid to manage it. I.e. National Disaster Management Authority, Red Cross Society, fire services, NGO, etc. Always appoint the qualified building professionals like structural engineers and architects for the design and construction of the building. The structural engineer considers the effect of the natural disasters at the time of design of the building, and hence you get a safe building. Always plan development or any construction work in accordance with codal provisions planning regulations, acts, by-laws, and get the permission from the government authority for fire and safety. The safety laws made by government bodies for the building are for the wellbeing of human beings. Also Read: How to Protect Yourself During an Earthquake? The excessive forces of disaster may affect the stability of building hence as soon as you see any distress sign in the building; contact the structural engineer for the remedial measures to prevent the building collapse either partial or collapse.